Subject: STATE OF HAWAII, ET AL., PETITIONERS v. OFFICE OF HAWAIIAN AFFAIRS, ET AL. Case Over The Sale and Transfer Of Ceded Lands. Your Honors, I Majesty Akahi Nui, as King of the Kingdom Of Hawaii Nation, it is my duty to inform you that, as the law of nations, international law, contract law, the law of equity, and treaty ( and other Law systems ) laws naturally come into play in these [international] matters of state. The only course for you to conclude as valid remains uncontested and without question; You cannot sell what you do not own, possess, or control. 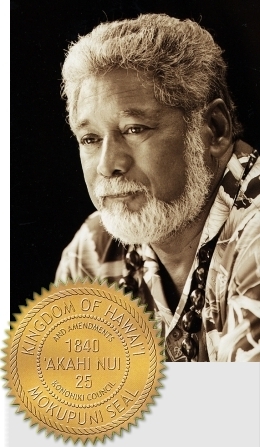 Until proven otherwise, the facts remain clear and uncontested as to my capacity as 100% Blue Blood Lineal Heir and King, the Sovereign Authority of the Kingdom of Hawaii Nation and Head of State of the Kingdom of Hawaii. 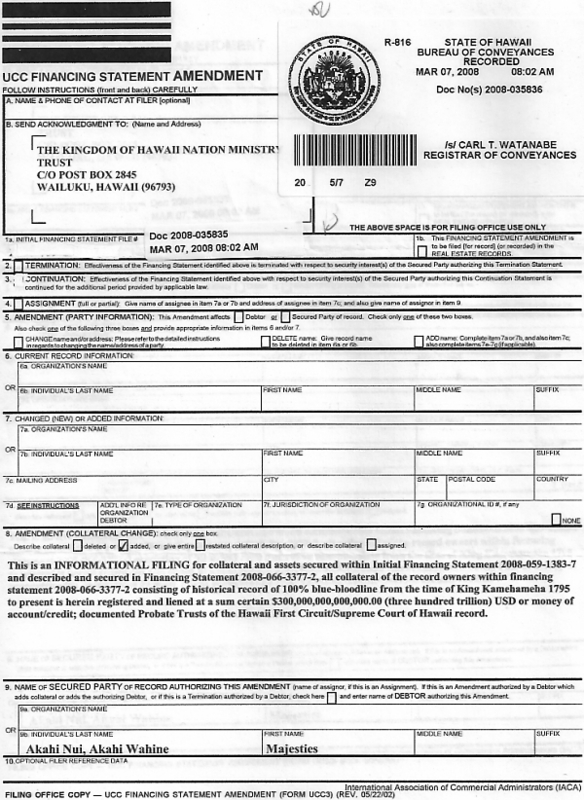 Until further factual documented evidence comes forward, presented in proper venue, these facts stand on their own merits in law and equity; I (as Creditor and Bailor) am the holder of the Superior Security Interest and own and control all rights, assets, lands and possessions of my Kingdom and am Holder in Due Course of the certified Royal Land Patent Deeds. The State of Hawaii (as debtor) has failed and refused to (and cannot) produce valid and clear title to any lands my Kingdom holds. With this in mind, as the highest court of justice of the government of the STATE OF HAWAII, bound by treaty law as prescribed within your honorable Constitution for the people of the united States of America, in your obligation towards justice, there is no option but to strictly adhere to your assignments and follow the respective applicable laws BASED UPON THE FACTS before you. For it is Law, not code, regulation and statutes which apply here and not the hidden history of a illegal military invasion against and upon a peaceful Island people. The facts of this matter, has been known for years, admitted and recognized even by President Clinton. The facts by and through the Declaration as mentioned below has never been rebutted to this day as applied to the Kingdom of Hawai'i Nation and the Hawaiian Land issue. Also, as the STATE claims to "own" the Hawaii Kingdom "ceded" lands, they refuse to bring forth their evidence of ownership, i.e. ; Title. Therefore, it is mandatory for your Court to compel the corporate STATE OF HAWAII to produce all the discovery and evidence that I have been asking them to supply and demanding from the STATE OF HAWAII; i.e. ; documented proof of their valid and clear title to my Lands/property, of which I am confident shall prove they have none. Should they, The STATE OF HAWAII, fail and refuse to bring forth and produce such evidence per your Order, then by and through your Honorable Court and authority, you must find in my favor, that as the King of the Kingdom of Hawaii Nation, that I, am lawful owner and Holder In Due Course of the Hawaiian Islands and in succession as such since 1895 and I recommend you find them invalid and without cause, standing as moot in these international matters of my Kingdom and your nation. 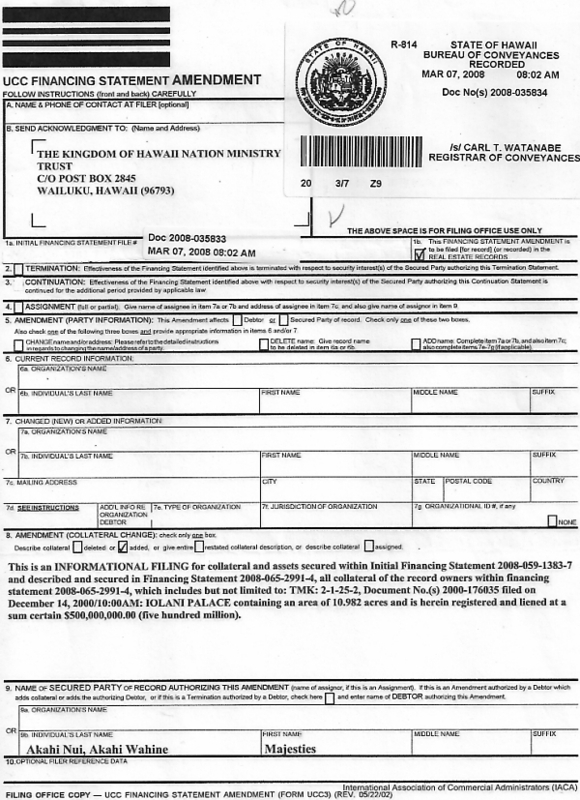 To assist you in this decision, please find attached/enclosed the 19 page "DECLARATION OF THE FINDINGS OF FACT AND ORDER TO RECEIVE AN ANSWER OF TRUE AND LAWFUL DOCUMENTS FACTS OF EVIDENCE OF JURISDICTION" and Royal Land Patent Deeds. Please be advised that in relation to the above Declaration, there is overwhelming evidence of the illegal status of the STATE OF HAWAII and as such, the historical record states that the illegal military invasion and takeover of the Hawaiian Islands was done by force 'de-facto' on this day... "UNITED STATES LEGATION, Honolulu, H.I., January 17th, 1893 - "A Provisional Government having been duly constituted in the place of the recent government of Queen Liliuokalani, and said Provisional government, being in full possession of the government buildings, the archives and the treasury, and in control of the capital of the Hawaiian Islands, I hereby recognize said Provisional Government as the de-facto government of the Hawaiian Islands. JOHN L. STEVENS, "Envoy Extraordinary and Minister Plenipotentiary of the United States of America." If there is no valid proof or documented evidence in any form, presented in your proper venue, then they must stand moot in dishonor in lack of standing and capacity as an 'owner' with clear tile, interest or otherwise. If the State of Hawaii cannot be found to possess valid title ownership, and rightful possession or having lawful Standing to occupy the Hawaiian Island (see the enclosed DECLARATION), then I humbly recommend that you find due to the economic and lawful risk associated with its very existence, dishonor and its continual criminal conduct, as their Act(s) and actions are ultra vires and fraudulent, causing acts of usurpation. I, as the King of the Kingdom of Hawaiian Nation, pray that you properly follow the necessary systems of laws and international law in your findings and conclusions, and choose not to violate the applicable laws in these matters. Your actions are before God, our people, and the peoples of the World who are watching and waiting due to the understandings of the full ramifications of your impending decisions. However, there is another side to this issue, one which mandates your attention, for the implications of your decision will have substantial impact upon the judicial, economic, administrative and foreign welfare of your nation. It is that the STATE OF HAWAII in its conduct as foreign (U.S.) agents upon our soil, are attempting to use your honorable court to collude in their ongoing attempts to complete the demise of my Kingdom, for their personal gain. In this the very nature of TRUTH and JUSTICE is at risk. To participate in their activity will place you alongside them in their criminal actions against international law. 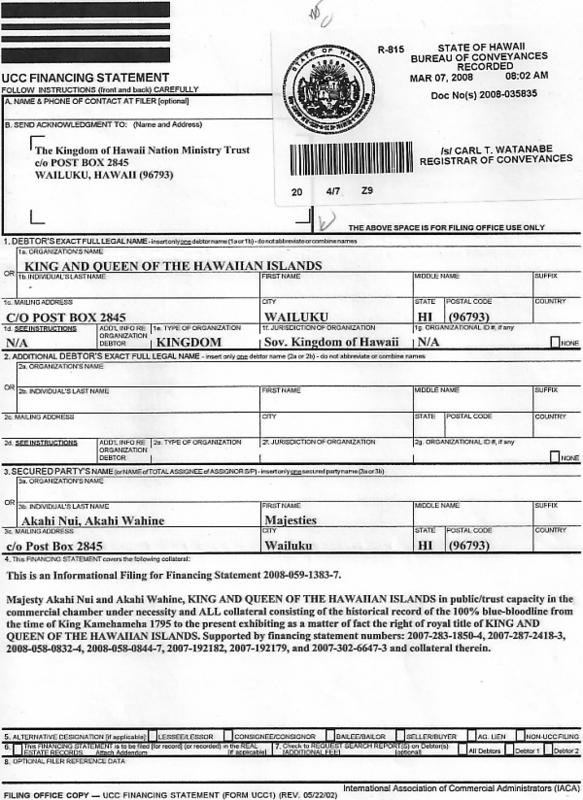 Therein, I humbly demand, you find that the Kingdom of Hawai'i is the exclusive Lawful owner of the Hawaiian Islands and the land(s) found thereon, and that The State of Hawaii, a mere rogue-corporation, holds no title(s) to the Hawaiian Islands and The State of Hawaii be concluded as invalid and this case and action be respectively dissolved immediately for the best interests of the good people within and of the Islands of Hawaii and the Kingdom of Hawaii Nation. As King of the Hawaii Kingdom, I herein and by this communiqué, demand my remedy for my Kingdom and my people before this Court and the Creator of the Universe.